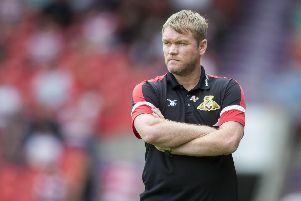 Doncaster Rovers boss Grant McCann says making progress in the FA Cup could help him in the January transfer window. McCann would like to add ‘two or three’ players to his squad when the window re-opens next month. Rovers fell at the first hurdle in this season’s Carabao Cup and Checkatrade Trophy but, ahead of today’s second round tie at Charlton Athletic, McCann admitted that the financial rewards in the FA Cup provide more incentive. Prize money has been doubled for this season’s FA Cup. The winners of today’s match will receive £54,000. Third round winners receive £135,500. “We’ve chopped and changed a little bit with the cup competitions,” said McCann. “Our priority is the league – one hundred per cent. “But the FA Cup is a lovely little bonus, especially financially for the football club. “It may help us a little bit in terms of the January window. McCann uses Lincoln City as an example of how a cup run can benefit a club. The Imps reached the quarter-finals of the FA Cup in 2017 as a National League outfit and won last season’s Checkatrade Trophy. They now sit second in League Two. “I think I for speak a lot of managers in League One and League Two especially when I say that it can change your whole year around if you get a run in the FA Cup,” said McCann. “Lincoln are a good example. They’ve strengthened their squad and done a lot of things behind the scenes to make themselves stronger. “It wouldn’t surprise me if they won League Two this season on the back of their cup runs. Rovers have no fresh injury concerns ahead of today’s game. McCann said there was a possibility that one player – most likely to be James Coppinger – could be rested for the trip.